Frances Raines knows the secret to successful aging. “Keep busy,” says the 97-year-old resident at Bethany Health & Rehabilitation nursing home, flashing a knowing smile that momentarily erases the wrinkles on her face. 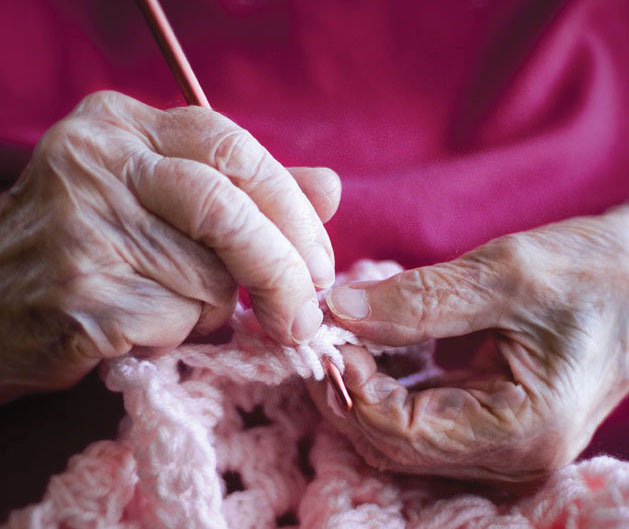 With a bright red crochet hook and yards of sky blue and royal purple yarn, Raines keeps busy through her stitches, even though macular degeneration clouds her vision. “I feel with my fingers and count 1, 2, 3, then 1, 2, 3,” she explains, proudly showing off the calluses on her hands. Her nurse practitioner, Jenny Kim, MSN, GNP-BC, marvels that she is able to keep track of the stitches without seeing them. Frances Raines. Photo by Lauren Owens. “Well, you never count above three!” Raines quips. “I was just humbled and in tears,” Kim recalls. “I brought them home to my kids and explained that she had macular degeneration and that it was just an incredible gift. Now I bring them in to see her and they ask me how she is, and it’s been neat to see the relationship evolve. We’ve known for many years that children are not just “shorter adults” and need their own brand of medicine in pediatrics. In the same way, the elderly are not just “older adults” and have their unique medical needs. As our bodies age, the physiology changes, impacting how medications are absorbed and how disease presents itself, for example. Priorities also change, with less focus on a cure or perfect health and more on maintaining function and quality of life. 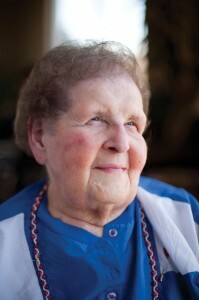 “Geriatric nursing is about promoting a patient’s function, maintaining their independence as much as possible and doing anything we can to improve their quality of life, with the caution that you understand how they define quality of life, because we all define it differently,” said Kim, geriatrics focus area coordinator for the Adult Nurse Practitioner Program at Vanderbilt University School of Nursing. Geriatric nurses can’t focus on the physical – perfect blood pressure readings or a cure for a chronic illness. Values are instead placed on comfort and function. The baby boomer generation has just started to turn 65 (the threshold for “old age”), and every day until 2030 about 10,000 more will cross that threshold, according to the Pew Research Center. The Census Bureau estimates that by 2050, 20 percent of the U.S. population will be 65 and over. In general, the baby boomers have had more access to health care and will live longer, straining a medical system that isn’t prepared to meet their needs. One of the biggest demands is for educated geriatric nurses. To meet the demand, a retooling is under way in nursing education. Starting this fall, there will no longer be a geriatric nurse practitioner specialty. Instead, two specialties will include more gerontological content – adult/geriatric primary care nurse practitioner and adult/geriatric acute care nurse practitioner. Additionally, geriatric core competencies are being integrated into other specialty programs. “Historically, geriatrics has not been thought of as a very exciting or glamorous specialty, and we know not enough people are going to choose to specialize in it. That’s why geriatric competencies are being embedded in other specialties so that those providers are better equipped to handle what’s coming,” Parish said. Critical thinking and mental flexibility are key skills for geriatric nurses. They spend much of their time in a gray area trying to make distinctions in a patient’s disease process – is it age-related or pathologic? Parish said many things the public thinks are hallmarks of aging, like incontinence or depression, are almost always treatable. But other issues, like kidney function and eyesight, are harder to tease out. Layered on top of that is the atypical presentation of disease in the elderly. Symptoms of a urinary tract infection in a 35-year-old include burning and not being able to empty the bladder. A 90-year-old may not exhibit any of these symptoms and instead have a change in mental status or function, the only clue being that she can no longer give herself a bath or fix herself breakfast. Once the problem is identified and the nurse is forming a treatment plan, there’s a golden rule for geriatric nurses – more medication, more problems. With aging, stomach absorption, metabolism and liver and kidney function all change, altering a medication’s life cycle through the body. Almost all people require lower doses of medications as they grow older, and geriatric nurses are constantly readjusting dosages. “The knee-jerk reaction is to add meds, and that’s a hard mold of thinking to get out of. But many times the medication is the problem and just taking away something can alleviate a problem,” Kim said. At age 90, Frances Fults, another resident at Bethany nursing home, decided to quit taking all of her medications. “And I felt so much better,” she said. “I didn’t recognize anybody when I was taking all that stuff.” Now, with rosy cheeks and perfectly set hair, she can get herself around the halls in her wheelchair and participate in all the activities. “Our society seems to emphasize curing and acute care, when many times it’s not what these patients need. They need someone to tell them it’s ok to not want to go get open heart surgery or take your cholesterol medication anymore. You’re not giving up; you’re just choosing a different path. A lot of times they’re just looking for that validation from us, and we have to be comfortable with that,” Kim said. Another gray area for geriatric nurses is the line between dementia and delirium, and this is one of the lessons taught during scenarios in VUSN’s Skills and Simulation Lab. The Simulation Lab is a safe place for nursing students to put nursing theory into practice, and with the push to include more geriatric core competencies for all students, common issues for older adults have been worked into the scenarios. That’s the science of geriatric nursing, but there is also an art – knowing when to take off your stethoscope and just sit down and have a conversation with your patient, carefully monitoring the family support system for caregiver fatigue, and being able to discuss how patients define an acceptable quality of life and how they envision their final days. Jenny Kim, like her VUSN colleagues, loves caring for seniors. Kim feels honored to be a part of their lives. Photo by Daniel Dubois. “A myth is that we assume all people in their 80s and 90s are ready to die, but the longer I’ve been in geriatrics, I’ve been reminded that that’s not true. There are some people who are very scared to die, and we have to be there to care for those emotional needs,” Kim said. Parish, who works on a nursing home floor where nearly all residents have dementia, spends much of her day advocating for patients who can no longer speak for themselves. She says the most important thing for aging adults is to put advance directives in writing – a durable power of attorney for health care and a living will. “I think we all have really different end-of-life wishes. Some people want any intervention that modern medicine can provide for them regardless of what state they’re in, and others feel there is a threshold at which they no longer consider life worth living. To have the people around you know exactly what that threshold means for you is so important,” she said. As a patient ages, family and friends become an integral part of the care team. Most often, it’s a female relative who will take on the caregiver role, and geriatric nurses are trained to assess a caregiver’s abilities and burden and watch for stress and fatigue. “At an assessment, we’re often looking not only at the person but also at their caregiver, because if the caregiver is too burned out to provide care, then we’re going to see an impact on the patient’s outcomes. We view them almost as a unit,” Parish said. Eunice Carroll, an 86-year-old resident at Bethany nursing home, has a wonderful advocate in her son. When she was put on a new medication for shoulder arthritis and quickly went downhill, he was able to connect her change in status to the new medication. For patients who are homebound with limited access to medical care, the VUSN House Calls Program is filling the gap. Begun as an outreach to the medically underserved in South Nashville, the program provides house calls to residents living in Davidson and Wilson counties. Two nurse practitioners make eight to 10 visits per day, managing a caseload of about 300 patients. “It’s especially important for the frail elderly who have limited mobility and access. It’s hard for them to get into a medical office and these patients would sometimes utilize the ER for primary care,” said Joy Lowe, MSN, FNP, GNP-BC, clinical director of Geriatrics Services. 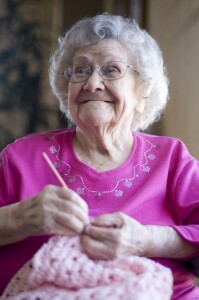 Eunice Carroll, an 86-year-old resident at Bethany nursing home, loves life. She is happiest when reading or discussing books with friends. Photo by Daniel Dubois. Lowe and her colleague Patricia Michael, MSN, FNP, mainly see hypertension, congestive heart failure, COPD and diabetes in their patients. In the winter, upper respiratory infections, pneumonia and flu are common. They order tests, prescribe medications, coordinate services and make referrals to providing continuing health management for these patients. In addition to primary care, they provide transitional care for patients who come home from the hospital but are not up to baseline yet, as well as palliative care for patients who want to die at home. Many who choose geriatric nursing have had some formative experience with a grandparent or older adult and want to repay that. Kim worked in a care home for the elderly before her sophomore year of college doing basic skills like bathing and dressing. She loved hearing the residents’ stories and getting their perspective on life in mid-century America. “Part of me just really grieved the fact that not a lot of people appreciated this field of nursing or these people,” she said. Geriatric nurses will freely admit it isn’t a glamorous specialty, but they feel called to care for their elders and ensure good quality of life for them. This entry was posted on Wednesday, April 18th, 2012 at 6:49 pm	and is filed under Features, Issue, Spring 2012, Vanderbilt Nurse News. You can follow any responses to this entry through the RSS 2.0 feed. Both comments and pings are currently closed.